Blood pressure is a common problem these days. A large number of people of all ages suffer from this silent killer and it becomes very important to monitor the blood pressure levels. 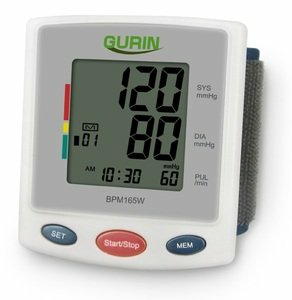 Gurin introduces the best digital blood pressure monitor for home use. This BP monitor is unique in its functions. 2. The digital display screen is easy to view and is equipped with LED backlights and large digital display. 3. The monitor has an inbuilt high quality sensor for reading the blood pressure and pulse rate. It is quick in taking readings. 4. The BP monitor comes with high capacity memory which can store numerous readings, to facilitate future treatment plans. 5. The cuffs are adjustable and fit into any arm size. It has a high quality gripping ability which prevents any form of fluctuations in the readings. 6. The monitor can take quick readings and save the results quickly in its memory. Resetting the monitor is very simple and can be operated with a single on off switch. The monitor is easy to handle and can be used single handily. A must have for all homes, especially those which have BP patients, heart patients and pregnant ladies. The device is durable and a low maintenance product. The design is compact, and it comes with a case for storage. Due to its high accuracy and precision it is highly recommended by doctors and pharmacists. The product is available at affordable rates and is highly ranked by its customers. The risk of fluctuation in reading with this digital blood pressure monitor is quite low, due to its high quality cuffs and high capacity sensors. The monitor comes with an easy to comprehend user manual to assist in its operations. The batteries are durable and are easily available at any nearby shop.